Subs Not Used: Mark Ridgers, Lee Ashcroft, Kris Boyd, David Syme, Scott McLean. There are some football clubs around the country who provide an excellent matchday experience. Killie, for example, have decent music, an announcer who provides important information, half time competitions, games for kids, cheerleaders and sometimes ex-players make an appearance on the pitch. Spare a thought then, for Hamilton fans. They are gifted run-of-the-mill music, an announcer who sounded as hungover as my mum must feel today and who provided no line-ups or crowd number information, no half-time entertainment and to cap it all off: another loss, this time to a very wounded Killie. 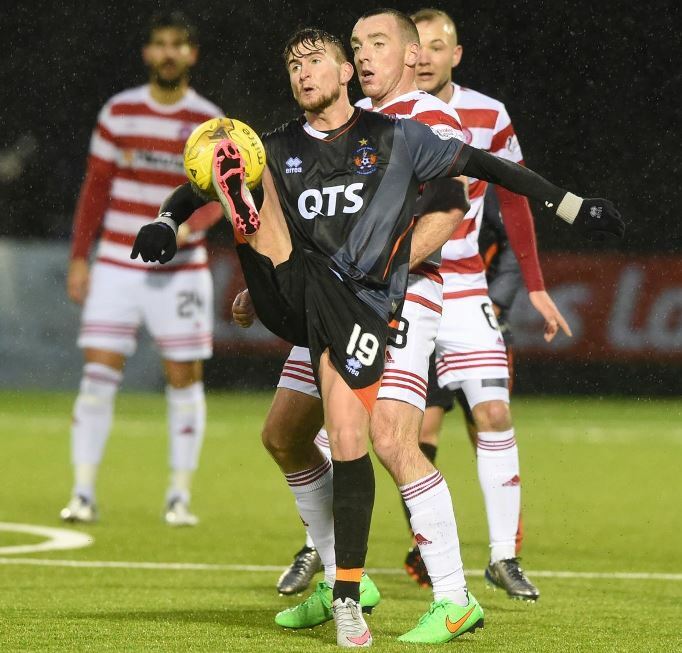 Both teams were coming off the back of a four-nil drubbing, Killie at home to Aberdeen, and Hamilton away to Dundee. Hamilton had one change to make, with Tena coming in for Sendles-White at the back. 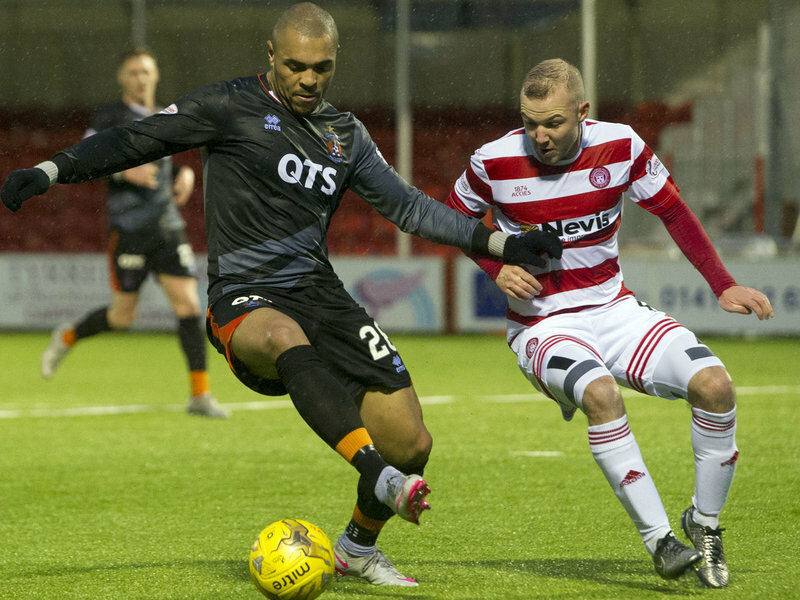 Under-fire KIllie manager Locke, however, had plenty of changes to make. Out went Barbour (rubbish), Connolly (note from his mum), Hamill (rubbish), Splaine (benched), and Boyd (benched). In came O'Hara at right-back, McHattie at left-back, Slater in the heart of midfield, and Frizzell behind sole-striker Magennis. Locke, once again, forced into playing arguably the best defense through injury concerns, rather than tactical knowledge or footballing common sense. Over 700 Killie fans braved the monsoon, out of hope more than expectation, and only a few more Hamilton fams did the same. It was clear from the outset that both sets of fans were watching two of the poorer teams in the league. Hamilton shot from the kick-off in a desperate attempt to change the game before it had got going. As the game got properly underway it was clear that Hamilton seemed content with long balls over the top of the defense and Killie seemed content with passing it to Obadeyi, only for him to lose it, either by being tackled, by tripping up over his own feet, or just by failing to trap the ball. He did manage to show his shooting expertise in the first five minutes with a shot which went well wide, Magennis' shot soon later was closer, but still off target. It was a scrappy game, not helped with the weather, nor referee Kevin Clancy's shocking bad performance. Hamilton's tactic of hitting long balls and then cutting the ball back for onrunners came close to fruition on a few occasions. However, either slack shooting, defensive blocks, great goalkeeping and, on one occasion, a goal-line clearance from Conrad Balatoni, stopped MacKinnon, Imrie, Lucas and Longridge from opening the scoring. At the other end, McHattie shot wide, Slater and Magennis had shots blocked, and Obadeyi had a shot saved. 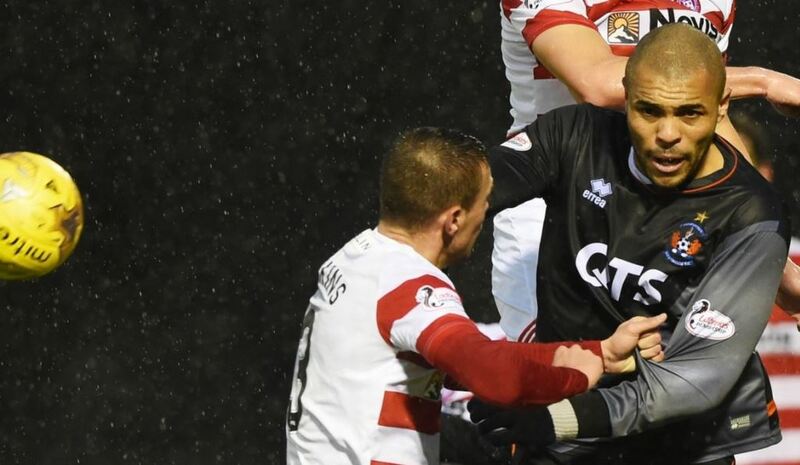 Magennis was getting a lot of heavy treatment from the Hamilton defense and when he was a little late with a challenge in front of the Hamilton dugout, their reaction was enough to convince Clancy to rub salt in Magennis' wounds with a yellow card. Carlton Morris then had an identical foul and card just a few minutes later. The second half was a lot more open than the first, with both teams trying for the elusive first goal. There were plenty of corners for each team, but some resolute defending for killie, and some shocking decision making at the other end, meant that they rarely came to much. 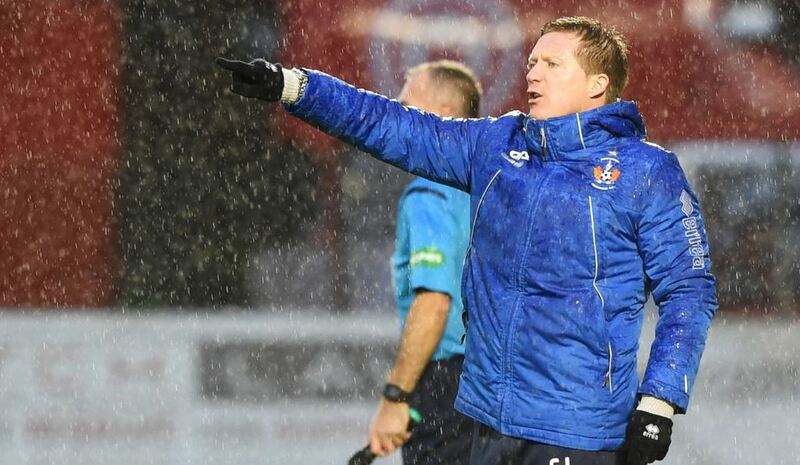 Killie have been caught out at the back post on plenty of occasions this season, and it nearly happened again when MacKinnon ghosted in to head towards goal. MacDonald, howvever, was in fine form. So too was McGovern, and he saved the day for Hamilton when he tipped over a Magennis volley after a fine McHattie cross. There then followed a lengthy delay as Tagliapietra was stretchered off after colliding with the Killie defense in the penalty box. The resulting seven minutes of added time would be a nervy period for both sets of fans. Sometimes, in football, the players who deserve a break never get it, and the players who deserve nothing, get everything. Obadeyi had been involved in many of Killie's moves in the game, although they normally ended with him. On the 69th minute, there was another example of this flow of play, although with a significantly different outcome. Kiltie and Magennis linked up well on the wing with Kiltie sending Magennis to the by-line. Magennis showed a great amount of composure to dummy his cross which then gave him bags of time to pick out Obadeyi coming in at the opposite side of the box. Tope, naturally, mishit his shot and the ball bounced hard off the artificial pitch, over the despairing McGovern, and into the back of the net. 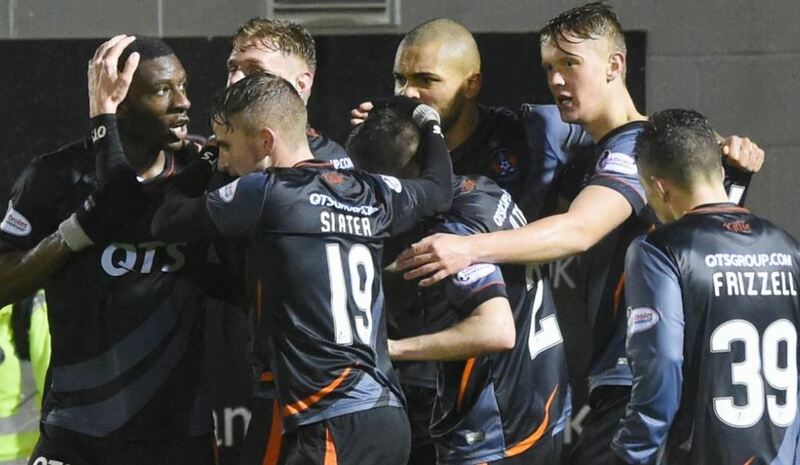 Given that he had being receiving pelters from the Killie faithfull all game, it was of no surprise that he ran away from the away end and celebrated in front of the Hamilton fans. Although, he might have just been confused. Hamilton made a couple of substitutions in order to try and change the outcome of the game, and Locke made a couple of substitutions to try and kill the flow of the game and waste some time. There were standing ovations for Frizzel and Kiltie, who both played exceptionally well. Meanwhile, Craig Slater (who also played very well) came close with a couple of free kicks and Magennis shot just wide after some strong holding play. At the other end of the pitch, Hamilton were unlucky not to score with a couple of good headers, one of which was fantastically saved by Jamie MacDonald. The seven minutes of additional time were mostly filled with the Killie defense booting the ball as far away from the Killie box as possible. When the forwards had a good chance to take the ball to the corner flag, they instead inexplicably decided to pass to Obadeyi. Naturally, Obadeyi lost possession and Hamilton went up the field again to cause more nerves to be frayed. In the end, Killie held out. MacDonald managed only his third clean sheet of the season, although it has to be said that that statistic is of no reflection on his ability as a goalkeeper. Questions have to be asked concerning any future selection of Captain Frantic, especially when the defense looks so much more assured without his presence. Celtic loanee Findlay looks particularly more confident at centre-back and it'll be a shame to lose him. On that note, it may be just as shameful to lose Greg Kiltie, whose contract expires next month. Next up, a lovely midweek trip to Dingwall to face a team who just stuck five goals past Dundee. You'll remember Dundee, they stuck four past us... naturally. Gary Locke: "We need to win football matches and keep yourself in jobs, the resuIt meant a lot. Obviously it has been a difficult week for us especially after last week, but I thought the boys did great. We moved the ball and created numerous chances. We have defended well in certain games but not others. We have worked hard on the training pitch this week because there was so much wrong with the defensive performance last week we didn't know where to start. But the boys have knuckled down, they've worked hard and they have responded today. I'm delighted for our supporters. I'm well aware we have been very inconsistent and we said to the players we need to find a level of consistency."